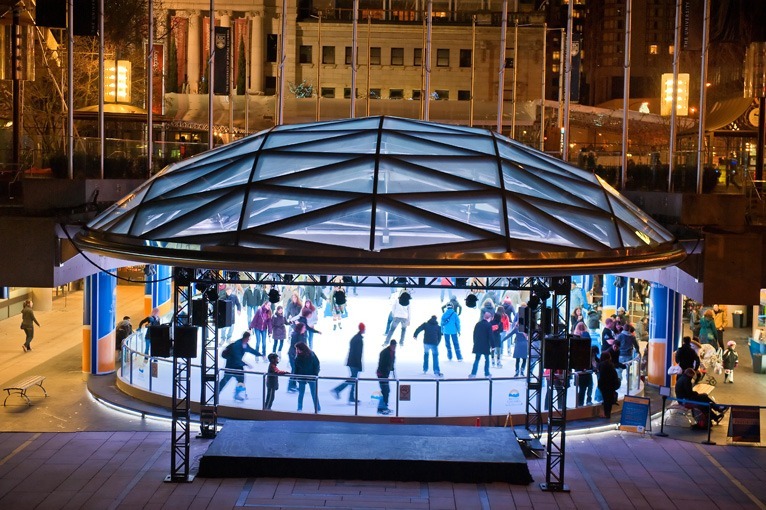 It’s one of Vancouver’s most popular winter attractions, and now the Robson Square Ice Rink just got even sweeter. With the city currently in the middle of a cold-weather stretch, people are still being encouraged to come for a skate on the downtown rink, with the offering of another classic cold-weather treat. A spokesperson for the facility told Daily Hive that from now until February 15, the first 50 patrons to arrive at the rink between 2 pm and 5 pm each day will receive a free hot chocolate. “We believe under the current weather conditions this will add to skaters’ experience and their enjoyment of the popular sport of skating,” said the spokesperson. Wedged under the covered outdoor plaza at Robson Square, the rink is operated seasonally by the provincial government when temperatures begin to dip. The rink is currently in the middle of its ninth consecutive winter season, after it reopened in late November 2009 following a $2-million repair and upgrade, funded partially by General Electric, in time for the 2010 Olympic Winter Games. Prior to the renovation, the rink was closed for nearly a decade.